Seize the opportunity to get recognized and receive the insights you need to build a High-Trust, High-Performance Culture™ today. Understand why current processes and systems are working—or not—and take action to improve the culture that enables them. Our 30 years of research, in over 40 countries around the world, has shown us time and again that investing in a high-trust workplace culture yields distinct, tangible business benefits. Great Place to Work-Certified™ organizations are automatically eligible for ALL Best Workplaces lists for 12 months, and the annual Best Workplaces in Canada list in partnership with the Globe and Mail. Research has revealed that there are a proven set of strategic investments that Best Workplaces make to develop and sustain a high-trust culture – ultimately driving their leading brand and performance in the marketplace. Easy-to-use, the Trust Index© Survey enables you to analyze your employees' perceptions of the workplace, compare results to key benchmarks, and receive custom recommendations. Choose a two-week period to deploy our world-renowned Trust Index© Survey to employees. Provide details about your organization's programs and practices through our Culture Brief™. Summary report providing your average scores for the five dimensions of trust. If 7 out of 10 employees give you positive ratings on your survey, congratulations! You're Certified. You'll receive a Great Place to Work® Certification badge and eligibility for all of our Best Workplaces lists for 12 months and your Great Place to Work® Online Profile for you to fact-check and publish. Certified organizations complete the more detailed Culture Audit© if you wish to be considered for our Best Workplaces in Canada National list, published in April (not required for Small organizations). Our team is here to help you get the most out of your culture efforts. 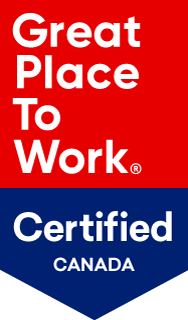 "Capital One chooses to partner with Great Place to Work® because they provide us with valuable insights and data on how we can unleash our associates to pursue the best version of themselves." "Working with Great Place to Work has allowed us to really narrow in on what separates a “good” workplace from a “great” one. We are able to gain valuable feedback to continually make improvements. Working with GPTW also allows us to benchmark to other organizations and ensure we are implementing and maintaining best practices." Why Great Place to Work? Unparalleled benchmarking data and best practices from leading organizations around the world. We’re business-minded people at a mission-driven organization. We know what it takes because we live it. Our partnership with The Globe and Mail means our customers get spotlighted in national press. Unlike many of our competitors, we offer affordable solutions for small business too.